May 17th, 2015 means our baby is no longer a baby. She’s a mare. And she is a gorgeous mare! Somehow, despite both our immense fears, we raised this baby, Cass and I. Cass knew a whole lot more than me, from the get go. I was there soley for support. We’d only just met 2 months prior, as she lightly stepped off the trailer in the darkness following her 3,000 mile trek from Canada. That night began the best thing I’ve ever done. That Preakness morning 7 years ago was my very first lesson in listening to my horse. We thought we had it all figured out. The “mare cam” was beautifully lit and set up in her stall. Cass had an audience that averaged about 100 a night watching her from all corners online. We watched and waited. Waited for the signs the baby was coming. The chat room forged friendships and false alarms. I can still feel the knots in my stomach when I think about the anticipation. I was terrified. What if something went wrong?! What if I had to get in there and pull that baby?! What if my beautiful Fairy Princess of a horse died?! My vet forbade me from anymore youtube clips of horse births. My Dad kept telling, “She knows what she’s doing.” And no truer words were ever spoken. As I arrived at the barn that 17th of May, after 2 full weeks of intense watching of the pot, I immediately sensed something was different. Cass gave me a knowing look. She demanded breakfast. A crowd began gathering around her stall. I was still (and would be for a while) scared of my Fairy Princess. I asked the much more experienced barn owner to go into her stall and check her. She obliged. 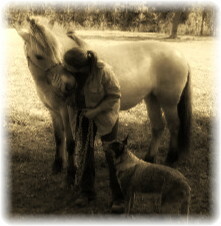 Two little hooves were attempting to peek out from underneath Cass’s tail! WhooHoo! Cass was way more concerned about finishing breakfast than the fact another being was trying to get out of her belly. Now comes the listening to my horse part. She finished eating. She looks deep into my face and says, “get me the Hell outta this stall, lady!” That was not in the plan. The camera was attached to the stall. The audience of 100+ had been diligently waiting for this very moment. I was in a panic. The crowd that had gathered were all speaking at once in excitement. I couldn’t even tell what anyone was saying. Except for Cass. I heard her loud and clear. Sigh. I put her halter and rope on and we took our first solo walk from barn to paddock. I’d been too scared to walk her myself before. Not this time. I had to listen to my horse. She wanted and needed out of there. It was going to be she and I against everyone else. Sorry everyone watching online! You won’t be seeing this birth. The beautiful thing was how exactly right my Dad was. Cass knew what she was doing. I don’t believe there’s been an easier birth recorded in all of history. Cass walked a few feet away from the paddock gate, gently laid down and within a few short moments, Becca slid right out. I did end up having to “go in there”. The birth was so gentle the sack didn’t break from her nose. I got to do that. Becca’s first breath was taken looking right into my face. Now, because Cass does know exactly what she’s doing, she immediately got up and demanded more food, even before cleaning the baby. It was all good! Welcome to the world! We’ve been waiting. Took her a few hours to get the swing of nursing. 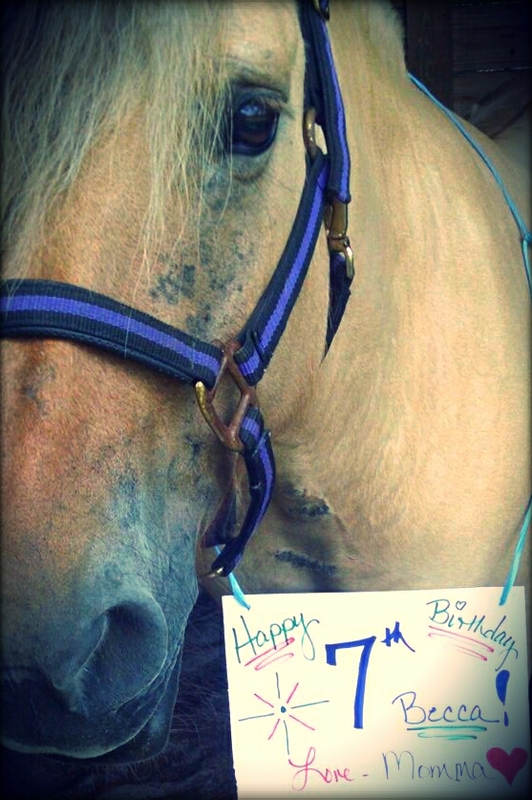 Now our baby girl is a 7 year old, magnificent mare. She’s becoming the horse we knew she was meant to be. 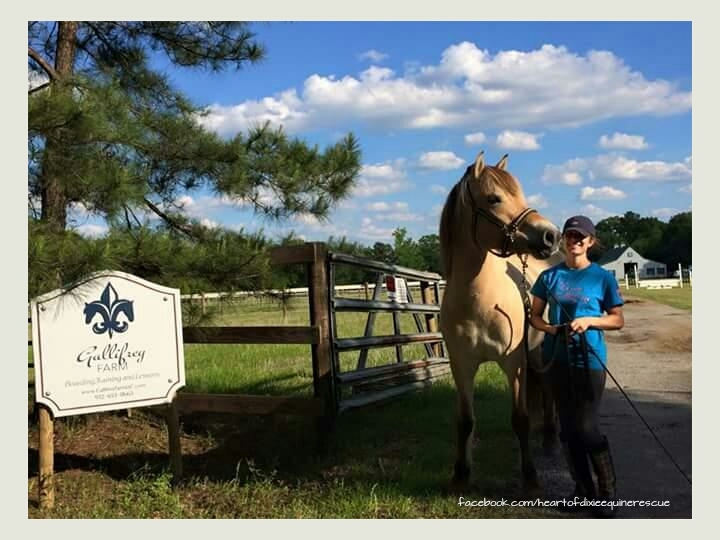 Becca is forging her own way in the world with the help of all the wonderful ladies of Heart of Dixie Equine Rescue. She’s taken to her training so well she may have a show career in her future. Becca is a mare who demands attention. But, then again, she did start off with a huge crowd. Cass is happy just to BE now. She is my Fairy Princess who happens to have been an excellent mother. I’m honored to have been able to help along the way, though she always knew exactly what she was doing. Momma Cass sends her baby birthday wishes. Becca & Catlin on a field trip. Cass has amazing hair. Fjordhorses just naturally have a lot more hair than your regular horse. Their tails are thicker and easily reach the ground. Their forelocks are natural fly masks. When I first got Cass…. oh, my… did we just have an anniversary?!?!? It was 4 years ago my own fairy princess came to be. She came bedraggled and tangled. We bonded thru grooming and I still can spend hours just brushing and braiding her mane and tail. Her breathtaking beauty was not far under the surface. Our sweltering Florida heat soon became a serious issue for our girl and a decision had to be made. Comfort or beauty? We tried to keep her long locks by having Michael thin them out but she was still just too hot. Her mane weighed a few pounds. I had witnessed her suffering from our heat for too long. I took a deep breath and whacked her mane off! She immediately felt better and I stopped crying after a little while. Norwegian Fjordhorses are supposed to be kept in the proper mane cut to accentuate their wonderfully, muscled neck. I still haven’t learned the “proper” way to do it but I’ve gotten fairly proficient. Cass is much more comfy and that’s all that matters. Today was a grooming day for both girls. I began with Becca since she usually tires me out. She behaved perfectly and we got done in no time at all! I’ve been letting her mane grow since she doesn’t have the same troubles with the heat or allergies as her momma does. Also, I’m lazy. Cass is now trained to clippers for her mane and I haven’t worked with Becca on that. I had decided to thin out Cass’s forelock rather than cut it short. We’re already having big bug troubles and I’d rather her eyes be protected. I pulled a ton of hair out with the thinning shears! Her forelock felt much lighter. That should make her more comfy, while still protecting her from nasty bugs. Brushed her tail but it’s not quite touching the ground, yet, so no need for a trim. Both girls got curry combed, brushed and fly sprayed. They were ready to have a great day in their little corner of paradise!